Surface Plasmon Resonance is an optical technique which determines the concentration of biomolecules in close proximity to the metallic surface. SPR detects changes in refractive index of the solution close to the metal surface. For the measurements a glass slide with thin layer of evaporated gold is used. The p-polarised laser light is shined through the glass onto the gold film at the angles close to the SPR resonance conditions. The beam interacts with free electrons in the gold layer converting the incident light photons into surface plasmons, which creates the electric field that extends into the solution. When the analyte concentration at the surface changes, the refractive index also changes, which affects the velocity of plasmons, and the conditions of resonance. This technique does not require any labeling of the interacting components. Experiments are performed at continuous flow conditions using microfluidic system to deliver the sample of the analyte to the sensor surface. 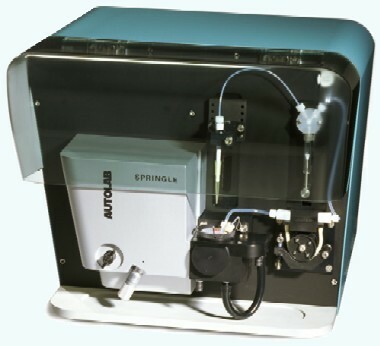 The Autolab SPRINGLE instrument is a single-channel SPR instrument equipped with an open-structure electrochemical cuvette. The samples are introduced either manually or semi-automatically. To enable electrochemical measurements, the Autolab SPRINGLE can be connected to any potentiostat/galvanostat.